Scorsese’s latest could not take us further away from the mean streets of New York mob violence that we associate with his name. Silence, epic adaptation of Shusaku Endo’s 1966 novel, transports us to the shores of seventeenth century Japan for an extended meditation on the resilience of belief. 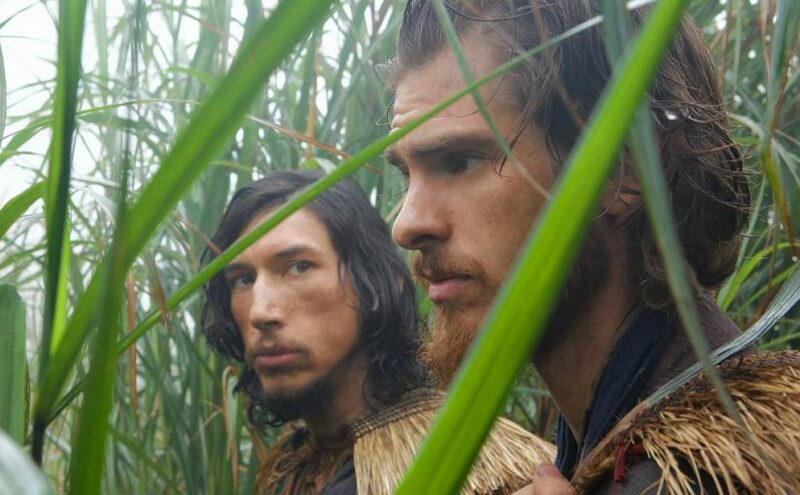 In a Portuguese-administered region of China, two Jesuit priests (Andrew Garfield and Adam Driver) confront their elder, unable to accept the whispers about their exalted mentor Father Ferreira (Liam Neeson). Word has it that he’s recanted his religion in the face of resistance to his missionary work on the Japanese Islands. The man who first inspired their devotion would never abandon his own. Would he? Of course, the only option to prove their conviction …is to go there and find him. While unthinkable, should these scurrilous rumours be true somehow, they would repay their debt by saving him in return. Believing it a lost cause Father Valignano (Ciaran Hinds) does his best to dissuade them, but their certainty demands validation …and he relents. Securing transport with an alcoholic fisherman desperate to return to the homeland, Fathers Garupe and Rodrigues steal onto Japanese soil and hide out, the Christianity they preach tantamount to heresy. Holed up in a wooden hut deep in the mountains, they keep watch on a community where this radical new religion is being tentatively trialled by a rebellious few, listening out for any lead on the whereabouts of their errant guiding light. Man of the moment Garfield heads up this statuesque drama, a role confirming his A-list credentials, even if his increasingly floppy hair threatens to test your own resolve. His ardent companion Adam Driver proves the more engaging persona though. Seemingly without effort, he exudes enigmatic gravitas. While Liam Neeson is by far the biggest name of the cast, as the lost treasure they seek, his screen time is minimal. But his spirit looms with the presence to drive the narrative forward and provide a satisfying conclusion. The coastal islands of Japan bear a picturesque but appropriately savage backdrop, fitting a visually alluring story of brutality, not beauty. Infrequent but shockingly savage bursts of gory punishment punctuate a ponderous pace that reflects the stoicism of enforced endurance. And if you’re not prepared to decelerate down to the same speed, it could be a frustratingly slow-moving experience. For this is a profound reflection on the hardship man is willing to withstand to commit to his higher beliefs. And a raw rumination on the power of faith versus culture, theology versus theory. One whose core question feels equally potent today. How justified are you in evangelising a personal ‘truth’? A doctrine that states that everyone who disagrees is wrong can only divide. Garfield, Driver and Neeson are the unstoppable force meeting the immovable object of a clashing cultural creed. Caught between the two, it is inevitably the mind or body of the individual that takes the strain …and breaks. That God remains silent is faith’s very foundation. Silence might also be the only way to stay true to one’s beliefs when others seek to destroy them. A protracted examination of patience under duress might, by its nature, test your own. But if you are open to it, in the end, Scorsese’s Silence speaks volumes.